Everyone is in the business of persuasion. We are always looking for new sensical ways to improve our business in any way possible. This workshop teaches you the “battle-tested” methods we use with clients in their organisations. 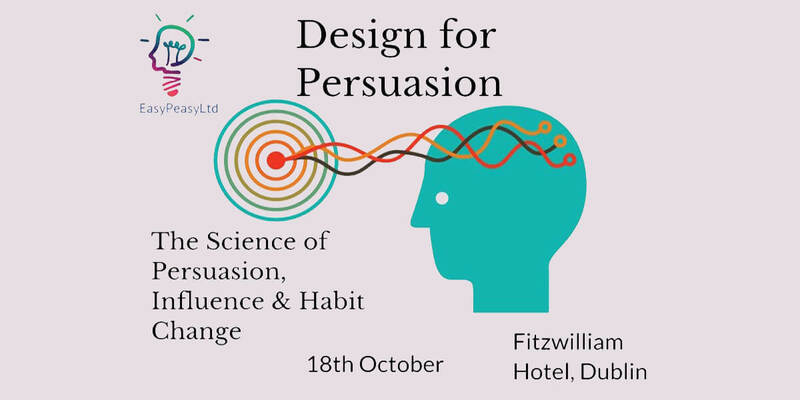 This persuasion talk teaches how to utilise various techniques derived from Behaviour Science/Behaviour Economics, Neuroscience, Psychology, Cognitive Behaviour and nudges among others to augment the complete experience of using design to improve pricing, marketing and the sales process in a transparent and consistent manner. You will be taken through the crafts, principles and mechanisms used by some of the most successful companies and give you the tools you need to apply them. triggers, and many many more. Find out how these techniques influence the dopamine, serotonin and other brain hormones and how to trigger behaviours and habits. CEOs striving to reconstruct their existing businesses. At the workshop you will learn about the leading techniques in Psychology, Behaviour Science, Marketing, Neuroscience by Nobel Prize Winners such as Kahneman (Thinking fast, Thinking Slow), Amos, Thaler (Nudge) , Schelling, Cialdani, Ariely, Levine, Weinschenk, Fogg, Eyal and numerous others. We will show how companies such as Netflix, Amazon, Facebook, Linkedin, Google, Microsoft etc have built their business model around these principles to build successful, profitable and sustainable business models. Places are limited to keep class size small enough to make this a deep learning experience. You are encouraged you to bring your team so that you can ensure consistent & rapid implementation of these techniques in your business and company culture. The aim is to be practical and hands-on. During the event you will get a chance to apply these techniques to an actual business.